Suspending a hold lets you continue moving up on a title's wait list without the title becoming available for you. 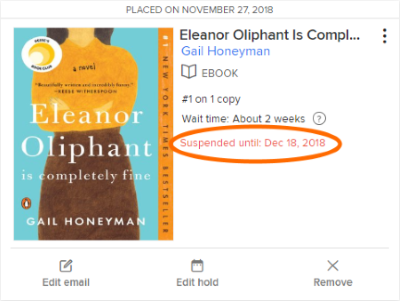 If you reach #1 on the wait list, you'll be in the first position to get the book once your suspended hold period ends. 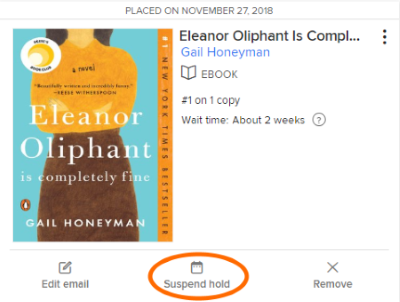 For example, you might want to suspend a hold for a popular ebook if you're on a long wait list for it, but know you'll be unable to read it because you're in the middle of another title. Use the steps below to learn how to suspend a hold. Select Suspend hold beneath the hold you'd like to suspend. 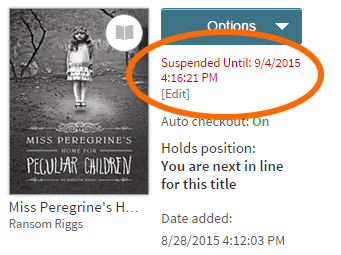 Choose the number of days you'd like to suspend your hold, then select Suspend. 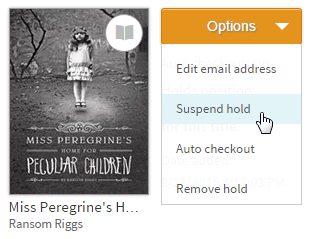 Once you suspend a hold, you'll see a "Suspended until" notification next to the hold. You can change or remove your suspension by selecting Edit hold. Sign into your Account in your library's digital collection. Select Suspend hold from the Options drop-down menu next to the hold you'd like to suspend. Note: The Suspend hold option is not available for all titles, like renewed titles. 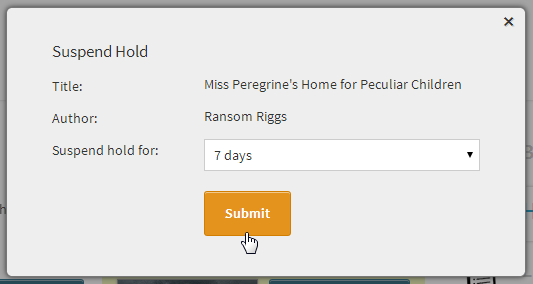 Choose the number of days you'd like to suspend your hold, then select Submit. 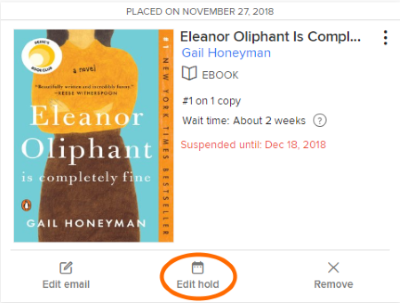 Once you suspend a hold, you'll see a red "Suspended Until" notification next to the hold that shows how long it will be suspended. You can change or cancel your suspension by selecting [Edit].